Sanjay Bambroo and Ashok Sethi. 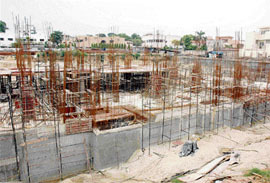 A mall under construction near the historic Ram Bagh gardens. Unabated construction activity without conforming to maintain essential historic character of the Holy City have raised many a eyebrows, especially among the conservationist and the old citizens. Recently the construction of a multi-storey complex on the Mall Road on the periphery of historic Ram Bagh Gardens, the summer palace of Maharaja Ranjit Singh has been stayed by a local court on the complaint of the Archeological Survey of India (ASI). The ASI, which is looking after the maintenance of the protected area of the Ram Bagh Gardens declared by the Government of India had objected to the construction of high-rise buildings within 200 meters of the garden. A few more such ‘unauthorised constructions’ have also come under the department’s radar. Unmindful of the norms set by the ASI, the construction activity, especially around the Ram Bagh Gardens, was going on unbridled by the civil administration and the corporation authorities. A senior conservationist and a leading scholar on heritage, Professor Balwinder Singh from the Guru Nanak Dev University, had lamented that the government has not come out with a comprehensive master plan to preserve the glorious heritage. He said the city planners must involve heritage experts to come up with a detailed plan to preserve the old historic buildings, a hallmark of Hindu-Sikh architecture, especially in the walled city. Even various traditional bazaars, including Atta Mandi, Guru Bazaar and Bartanwala Bazaar, situated in the walled city seem to be losing their character. The city has a number of landmark gates and buildings constructed with Nanak Shahi bricks and steeped in Indian style of house design. The district administration and the department of town planning have recently undertaken a comprehensive study to prepare a detailed note about the old buildings and prepare guidelines for the future master plan of the city. District Town Planner M.L. Kaushal, confirmed that a plan was underway which would seek various inputs from the NGOs and individuals to frame new guidelines for keeping the city’s character alive. It would be a blend of old housing traditions and modern architecture.